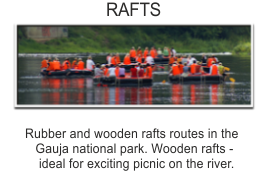 MAKARS - boats, canoes, rafts and camping. 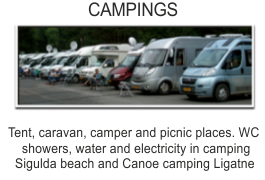 Camp site are included in camping guide books like: ADAC: ACSI; ECC; Kosmos campingwijzer and others. Janis Makars works in tourism since 1975. In Sigulda tourist center he was senior instructor who was responsible for organizing sports events, boat and bike tours. In 1991 family owned business called Pavadonis was established, which offers variety of tours in Gauja National Park. In summer it was combination of hiking, canoeing, cycling and horse riding, in winter tours on cross country skis. Camp site Siguldas pludmale was created where people can stay in tents, caravans and campers. Karina Makare has been involved in tourism since childhood, more active in business since 2002. 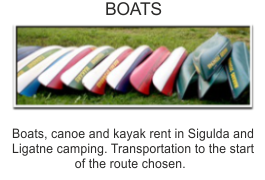 2010 company expanded and Canoe camping in Ligatne was built.